Thanksgiving is over and finals are upon us. By us I mean college students. When finals come around, I don’t really even think about what I’ve eaten in a course of a day and how good it is for me. I want to eat things that will keep me from crying, curling into the fetal position and sobbing uncontrollably as I try to keep my grades up. It’s a time where I don’t get much sleep, spent too much time trying to find something to watch on Netflix and wear yoga pants almost all the time. Speaking of Thanksgiving though…My roommate and I just finished eating most all of the leftovers. This year we toned down our turkey game (went from 18 lbs to a puny 14 lbs) but stepped up our potato game. Just because we spend Thanksgiving away from home does not mean that we settle for less. 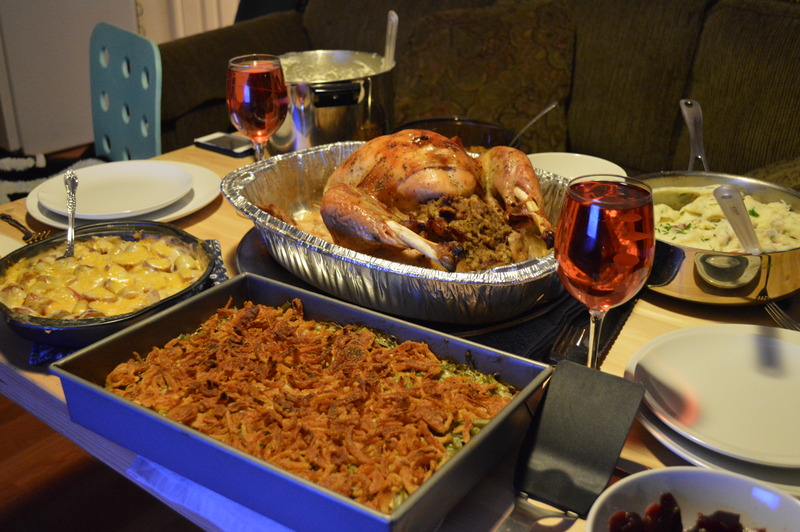 We made a full spread of turkey, green bean casserole, stuffing, two kinds of mashed potatoes, cheesy potatoes, rolls and of course that nasty (amazing) canned cranberry sauce. Oh. And lots of wine. And mimosas. And…mulled cider. The meal was about the leftovers, as I think Thanksgiving always is. The morning after, I carved the entire turkey and immediately froze about two pounds. The remaining turkey was eaten in Thanksgiving leftover bowls, sandwiches and then thrown into these cute little baby pot pies. I make a bunch of them, stick them in the freezer and we have our own homemade little dinners/snacks/anytime meals. It’s a great way to use leftovers—you could use leftover chicken too! Plus they’re really cute. Like me, duh. 1. In a large saute pan or pot, melt the butter and add flour. Stir together and cook until it turns light brown (this is called a roux). 2. Add in chicken broth, whisk until the roux dissolves into the broth. Add milk, whisk together and cook on a low simmer for 1 minute. 3. Add in spices, sugar and salt, cook until the milk mixture thickens to coat the back of a spoon. 4. Sir in turkey, vegetables and mix until well combined. Take off heat and let cool. 5. Cut rounds of pie crust (about the size of the mouth of a red solo cup). 6. Place dough rounds in cupcake tin, press to cover sides. 7. Fill dough cups with 2 heaping tablespoons of filling. 8. 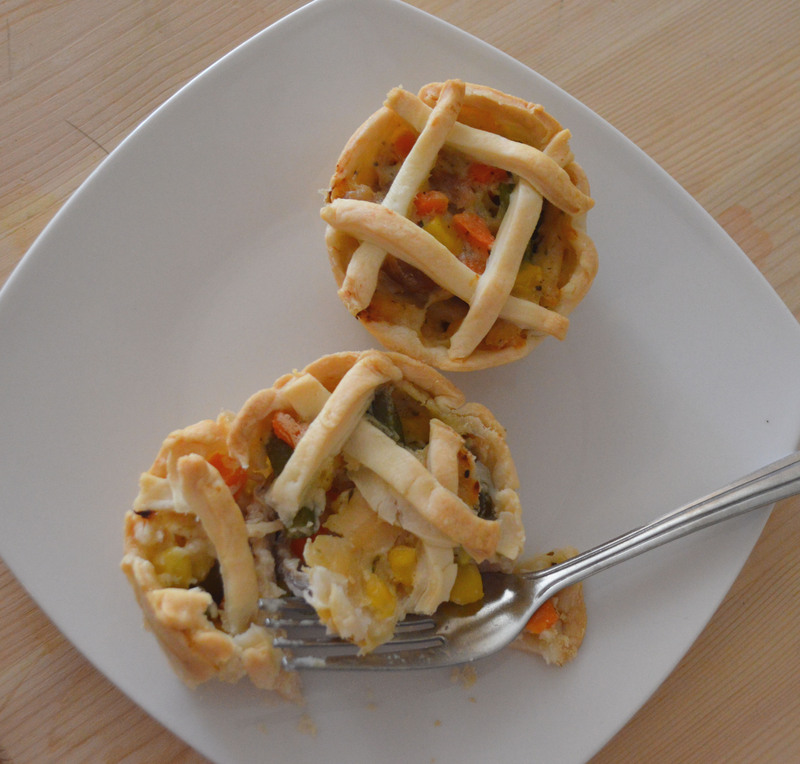 Use leftover dough pieces to lattice the tops. 9. Bake at 375 for 30-45 minutes until browned. Serve immediately or let cool and freeze! 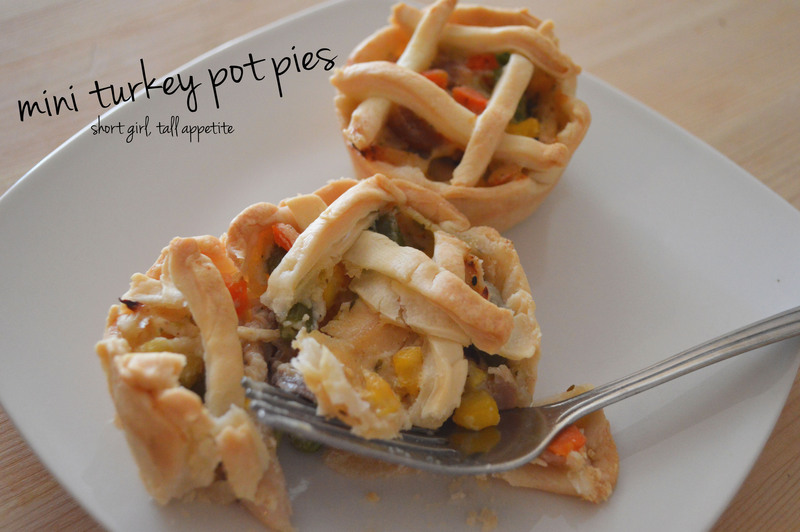 This entry was posted in Appetizer, Dinner, Make & Freeze, Turkey and tagged appetizer, dinner, easy, leftover, make and freeze, mini pot pies, turkey leftovers. Bookmark the permalink.